These days many fear that Armageddon has come. But, although this apocalyptic event draws near, it can’t be next! This is because there are Bible prophecies that have to happen before the Campaign of Armageddon can occur. Yes that’s right Armageddon is a campaign rather than a major battle. • The Victory Ascent (of Christ) Up the Mount of Olives. But, what must happen before Armageddon? 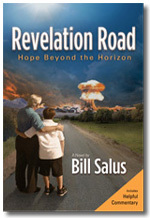 Messiah’s Branch Radio interviews Bill Salus about the insightful topic included in his new bestselling book Revelation Road, Hope Beyond the Horizon addressing the coming Greater Israel. “Israel is about to become the next emerging market,” Bill points out. This fascinating interview reveals the numerous scriptures evidencing that Israel is about to become larger, safer, and regionally superior after the war of Psalm 83. Big things are about to happen to little Israel. Click the following link to listen to the Messiah’s Branch Radio interview featuring Bill Salus. (i) The Footsteps of the Messiah, by Dr. Arnold Fruchtenbaum pages 315-361.